The high temperature coatings market, along with its applications, witnessed a moderate to high growth in the past few years and is likely to continue so in the in the coming years. This growth is mainly driven by the growing application sectors of power & chemical plants and oil & gas, metal processing, cookware, stoves, and automotive industries in Asia-Pacific. Asia-Pacific is the biggest and the fastest-growing market for high temperature coatings. The dominance of the market by Asia-Pacific is attributed to the growing demand for automobiles in India, China, Japan, and South Korea. North America and Europe are mature markets and are expected to register low-to-moderate CAGR compared to Asia-Pacific. 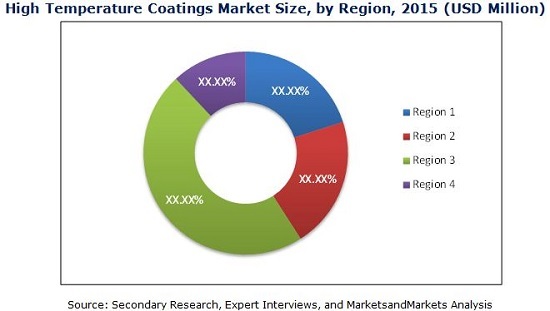 This study aims to estimate the market of high temperature coatings for 2015 and project its demand till 2020. This market research study provides a detailed qualitative and quantitative analysis of the high temperature coatings market. Various secondary sources such as directories, industry journals, and databases have been used to identify and collect information useful for this extensive commercial study of the high temperature coatings market. Primary sources such as experts from related industries and suppliers have been interviewed to obtain and verify critical information as well as to assess prospects of high temperature coatings market. Competitive scenarios of the top players in the high temperature coatings market have been discussed in detail. Leading players in this industry have also been profiled and their recent developments and other strategic industry activities have been identified. The key manufacturers of high temperature coatings are AkzoNobel N.V. (Netherlands), The Sherwin-Williams Company (U.S.), PPG Industries Inc. (U.S.), The Valspar Corporation (U.S.), Whitford (U.S.), Weilburger Coatings GmbH (Germany), Axalta Coating Systems (U.S.), Jotun A/S (Norway), Aremco (U.S.), Carboline (U.S.), Hempel (Denmark), Belzona International Ltd. (U.K.), and Chemco International Ltd. (U.K.) among others. The high temperature coatings market size, in terms of value, is estimated to reach USD 4.24 Billion by 2020 at a firm CAGR of over 4.56% between 2015 and 2020. The high temperature coatings market registered a moderate growth in the past few years and is likely to continue so in the coming years. This growth is driven by the rising power & chemical plants, oil & gas, metal processing, cookware, stoves, and automotive industries. Currently, the Asia-Pacific region is the largest market of high temperature coatings and is estimated to witness the highest CAGR. Countries such as China, India, Japan, South Korea, and Taiwan are expected to lead the Asia-Pacific high temperature coatings market, with China accounting for the largest share in the regional demand. Currently, the market size, in terms of volume, for high temperature coatings is comparatively low in Mexico. However, Mexico is expected to grow at the highest rate in North America. North America and Asia-Pacific are the most active markets in terms of strategic initiatives undertaken by the market players. Factors such as huge and increasingly addressable customer base and the shift in manufacturing base from North America and Europe to Asia-Pacific are driving the growth of the market for high temperature coatings in Asia-Pacific. The leading high temperature coatings manufacturers are AkzoNobel N.V. (Netherlands), The Sherwin-Williams Company (U.S.), PPG Industries Inc. (U.S.), The Valspar Corporation (U.S.), Whitford (U.S.), Weilburger Coatings GmbH (Germany), Axalta Coating Systems (U.S.), Jotun A/S (Norway), Aremco (U.S.), Carboline (U.S.), Hempel (Denmark), Belzona International Ltd. (U.K.), and Chemco International Ltd. (U.K.) among others. This report covers the high temperature coatings market by key regions and the important countries in each of these regions. It also provides a detailed segmentation of the high temperature coatings market on the basis of resin type, technology and key applications.